Shortly after I started skating but long before I started sewing I was in middle school. Which, I suppose is a time of life that many people have to suffer through. Compounded with the general yuck that is life in middle school, I also had to suffer the pain that was riding the bus. To the very last stop. For over 40 minutes a day I was stuck on a bus full of noisy, annoying, rude kids yelling and poking and insulting each other as loudly as they possibly could. And so, to lessen the pain that was my daily commute, I spent the bus ride buried in a book. So I read through quite a few books rather fast, and when the school book fair came around I decided I was going to buy the biggest book I could find. This book happened to be The Path of Daggers by Robert Jordan. I was really excited to start reading such a large book, until I realized it was book 8 in The Wheel of Time series. Well, damn. That’s a lot of reading. So I high tailed it to the nearby used book store and managed to pick up books one and two: The Eye of the World and The Great Hunt. As I was making my way to the counter to pay, a random woman whom I had never seen before and have never seen since stopped, pointed at my newfound treasures and said “Oh, so so so good! You will love them.” With my expectations raised I started in on the first book. It did not disappoint. And so, I have had a rather profound love affair with this series for well over a decade and have been seriously coveting Wheel of Time costumes since about 200 pages into the series. And, obviously, as soon as I had a reason to make a costume, first thing I wanted to be was an Aes Sedai, one of the powerful “magical” people in the series. Suffice it to say that to have a decent Aes Sedai costume, one needs a “Great Serpent Ring” (aka ouroboros) and a long-fringed shawl in the color of one of the seven Ajahs, or sub-societies of the Aes Sedai (blue, green, yellow, red, grey, white, or brown). For so many reasons I had settled on blue as the color for “my Ajah” many years ago, so I made it my quest to find an ouroboros ring and create an Aes Sedai shawl. The first step was to find the ring. The Great Serpent ring is described as being a gold ring of a serpent eating its own tail. At the point when I was looking for said ring, there was no officially licensed jewelry available (the Museum Replicas were only making Heron marked blades at that point), so I was sort of on my own to find an acceptable ring. So I settled on the rings made by Badali. Of course, as with all things, the price of their silver and gold jewelry has gone up significantly, so I am still quite please with my purchase. Their craftsmanship is quite lovely I might add. I am not affiliated with them, just a very pleased customer. In any case, apparently I chose wisely, because soon after I had ordered my ring it was announced that Badali would produce official Wheel of Time jewelry. Sigh. But, I do love my ring, even if it is not the “official” ring. It took many many years to even find someone who made gold ouroboros rings, so I do not regret my ring purchase in the least. 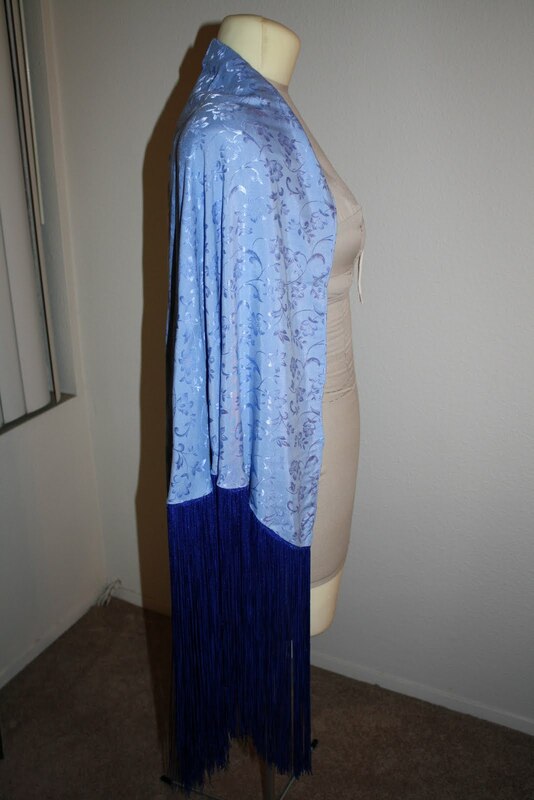 The next step was to produce my own long-fringed blue shawl. In so many scenes in the book, the shawls are described as having embroidery and long swaying fringe. Now, I don’t know how many people are really in the market for long colored fringe, but let me tell you, it is NOT easy to find. Sure, 2-3″ is easy. Even 6″ is not difficult. But 6″ is not long. It doesn’t sway when you move. I had always envisioned extremely long, dripping over your arms type fringe. 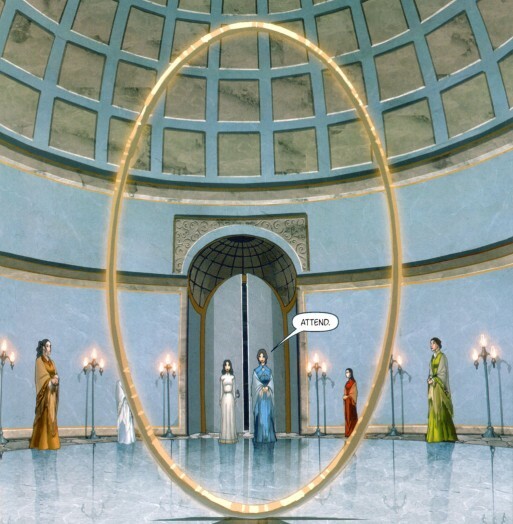 Apparently I was also correct in this assessment, because when New Spring was produced as a graphic novel, the Aes Sedai were all dressed just as I had imagined. 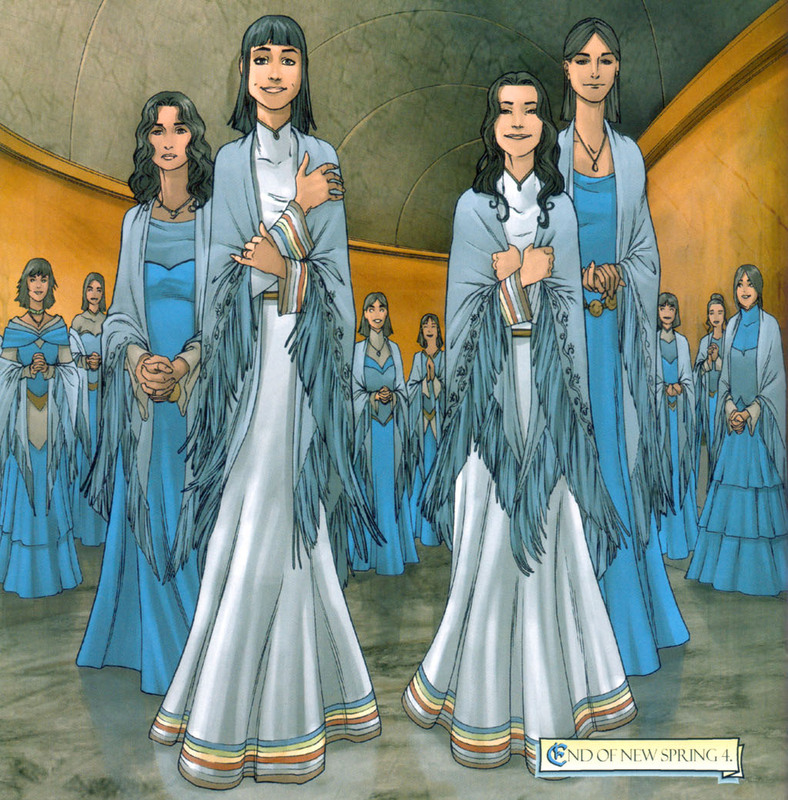 Aes Sedai of different Ajahs in their shawls. Aes Sedai long fringed shawls. Clearly more then 6″. So I spend a good many hours visiting fabric, costume, and dance supply stores and trolling the internet. I will now share with you, dear readers, my closely guarded secret for the best, and mayhap the only place to buy long fringe: Crazy Crow Trading Post. 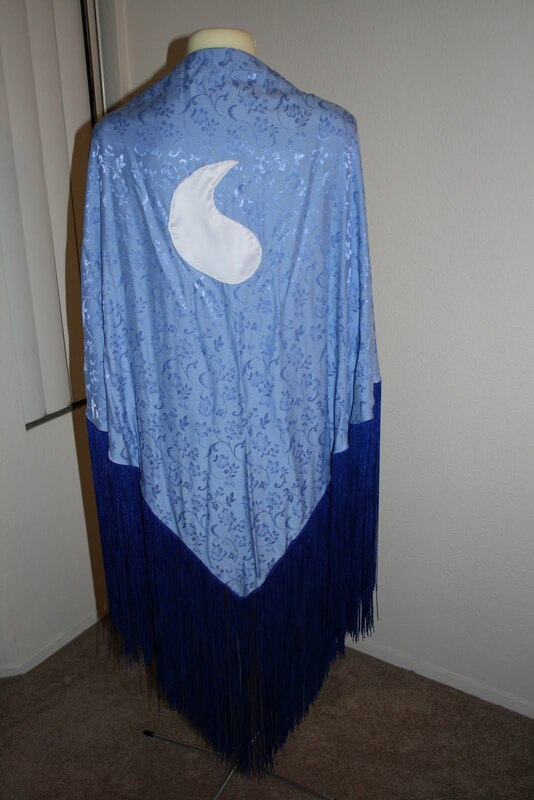 This website has supplies for many Native American dance/costume needs, and has many colors of both 14″ and 18″ chainette fringe, as well as spools of fringe so you can make your own at any length/color you want. Score! 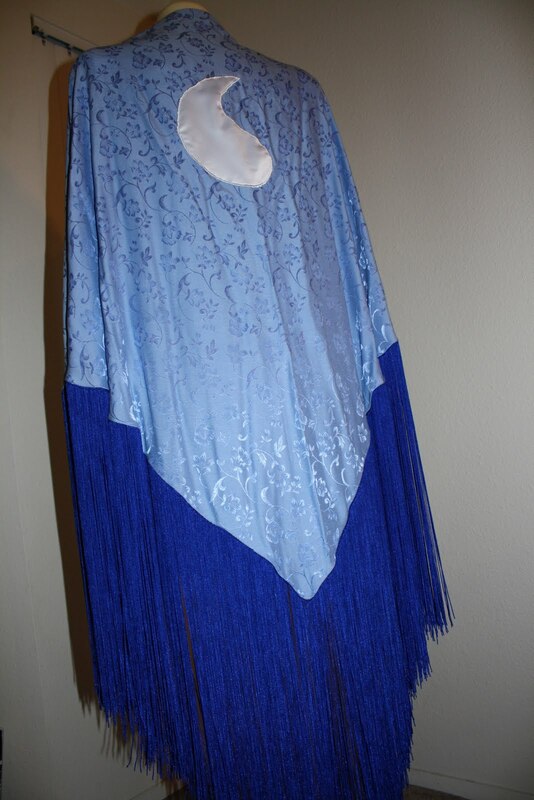 18″ blue fringe. Amazing. I will also warn you that by purchasing from them you will open your mailbox to a floodgate of advertisements for Native American events and letters imploring you to “help your people.” Now, I already get so much junk mail that I think of this as just one more thing for the recycle bin, but if you do order from them you will be inundated with a mess of mailings. However, in my opinion, totally worth it. 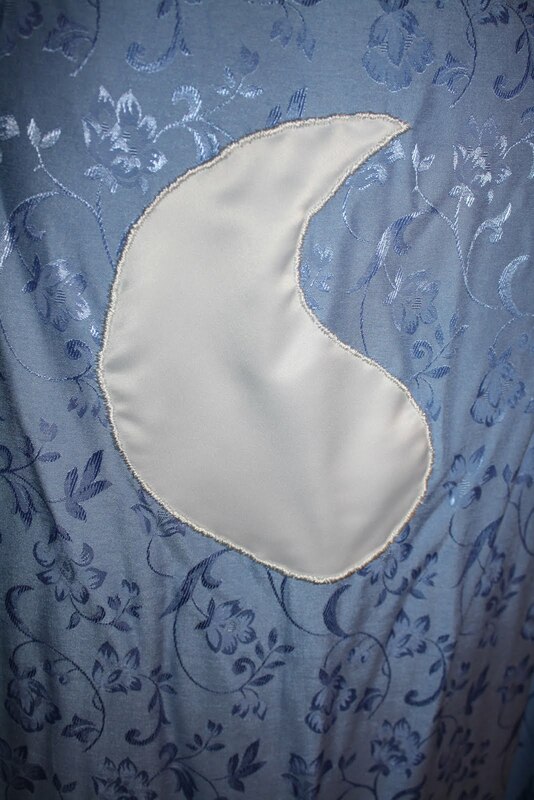 So for my first try on the Aes Sedai shawl, I got some light blue fabric and tried to embroider along the edge. However, hindsight says the fabric was too stiff because the shawl didn’t really sit well on my shoulders and I never actually finished the embroidery. 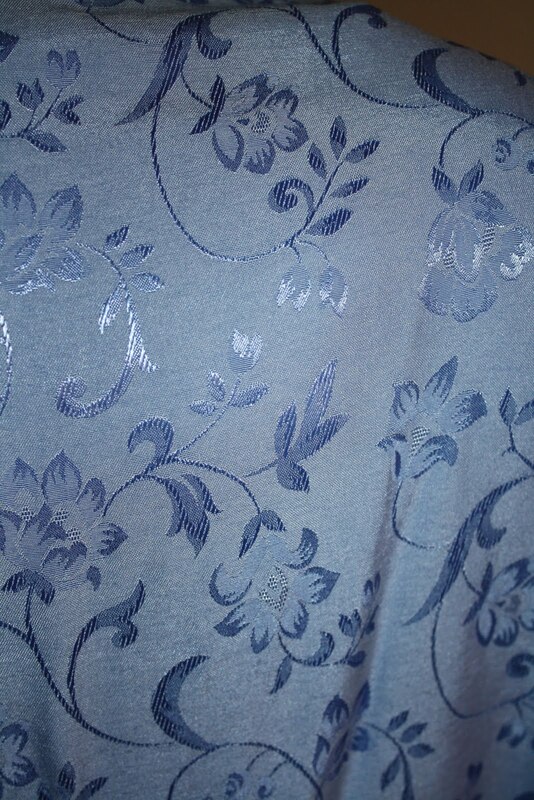 So, recently, I found some nice blue jacquard (I think?) fabric of unknown fiber content in the $3/yard remnant/flat fold section of the local fabric store. I don’t know what it is made out of, but it had the “embroidery” built in and, more importantly, it had a much softer hand than my previous attempt. To make the shawl, I measured my arm span (finger tip to finger tip) and used some geometry to figure out the angle I needed to cut the fabric. Basically it is a yard of fabric cut into a triangle. Then I found one of the Wheel of Time Aes Sedai icons online and expanded the size by 400%, cut it out, and used it as a template for cutting the white tear drop shape for the shawl’s center back. 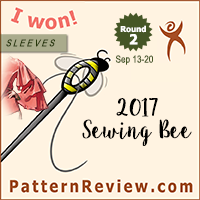 I finished the edges with a narrow hem. Then I hand basted the white tear drop onto the shawl and hand embroidered around the edge using embroidery floss. Lastly, but most important, the fringe came off shawl #1, went onto shawl #2, and now it adorns one of my favorite, all be it simple, pieces that I have made. From the side. Lovely drape over the shoulders now. The Flame of Tar Valon. Hand embroidery around the outside. It looks less rumpled in real life. And so, my quest was complete. I had a ring. I had a shawl. But now, I needed a dress. 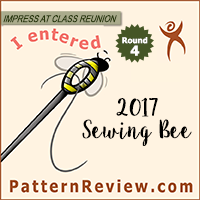 Which shall be reviewed in a future pattern review post. So anyway, although it really was the need for skating costumes that got me sewing, I won’t deny that the long seeded desire for a blue fringed shawl didn’t help push me over the edge. Hi! I recently made an Aes Sedai shawl and yours was a HUGE help, so I was wondering if I could do a shoutout to you and give a link to your page. Of course! Always glad to help a fellow Wheel of Time fan.